This 1/9 size, 4” deep stainless steel steam table pan will hold hot and cold food at the proper temperature in your buffet line. 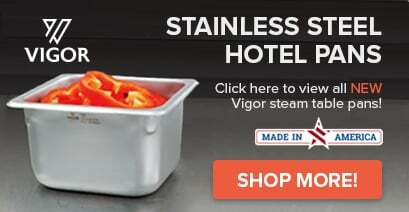 If you run a catering business, buffet, or hotel, this 4” deep, 1/9 size stainless steel steam table pan is perfect for daily use in your establishment. This pan features reinforced corners, adding strength where the pan takes the most abuse. 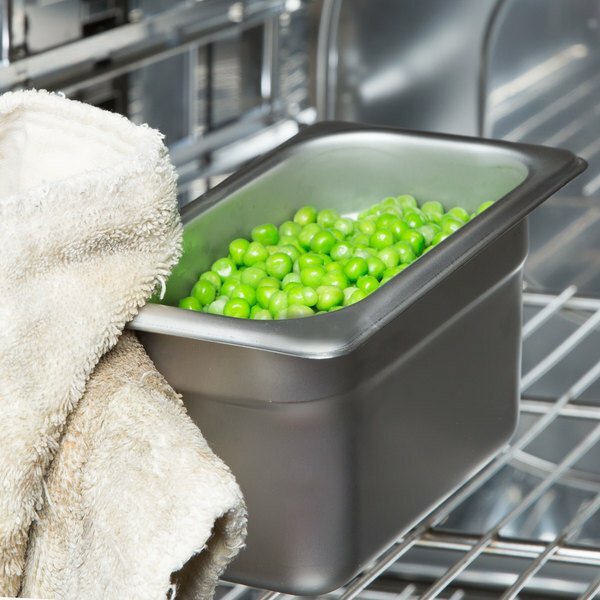 It can also be moved from the freezer to the oven without warping, which ensures a longer service life. 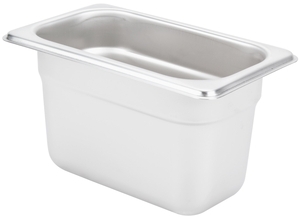 "Very durable stainless steel 1/9 pan. Easy to clean. Perfect for storing bar condiments such as cherries, orange slices, and lemon slices. I highly recommend this product!" 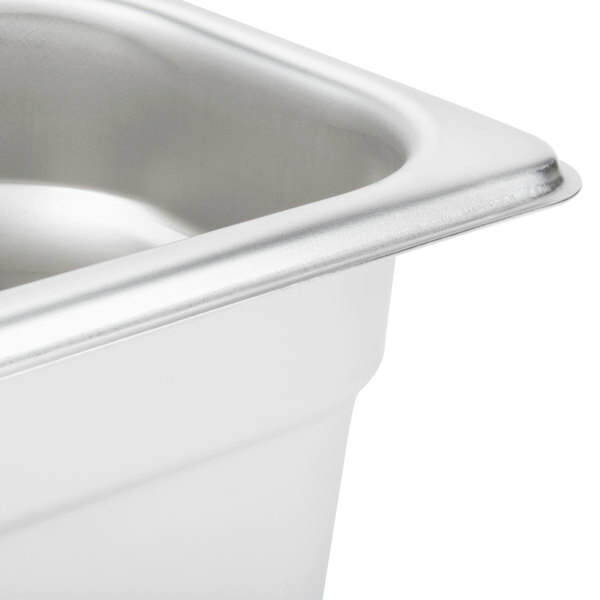 Each stainless steel steam table pan features anti-jam stacking lugs, so it won't stick to other pans when you take it out of storage. This feature allows you to save space by stacking pans without worrying about a hassle the next time you want to use them. 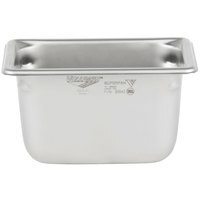 This pan is perfect for buffet lines and catered events because of its versatility. 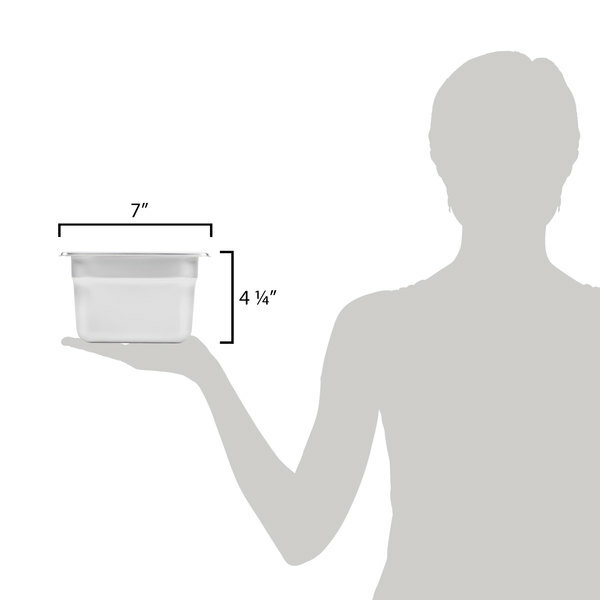 It can hold both hot and cold food, and it is easy to clean and refill. 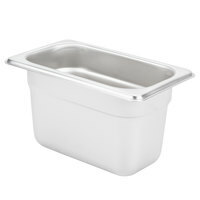 Each pan features sturdy reinforced corners, which makes it easier to carry and more resistant to warping or breakage. 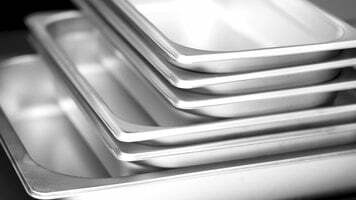 We use these stainless steel hotel pans for so many kinds of foods in our restaurant, from fresh cut fruit to freshly prepared tuna salad. 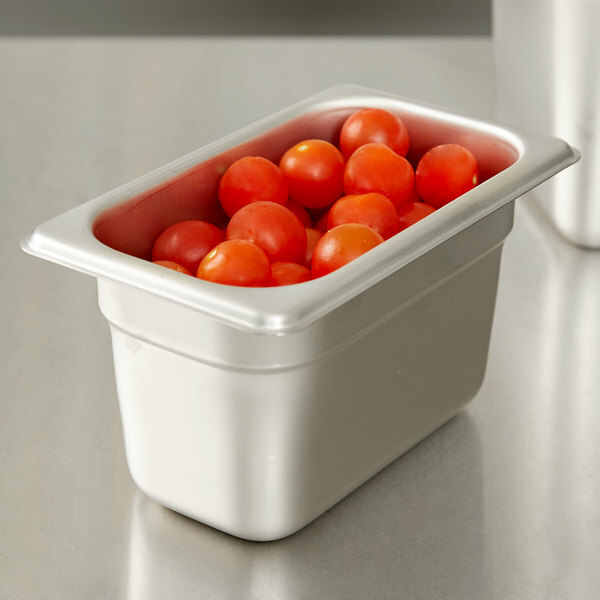 These hotel pans are ideal in order to have mini dressing and ingredient pans at your disposal. Fill multiple and just plug and play. It works great! These fit perfect in our Avantco fridge. 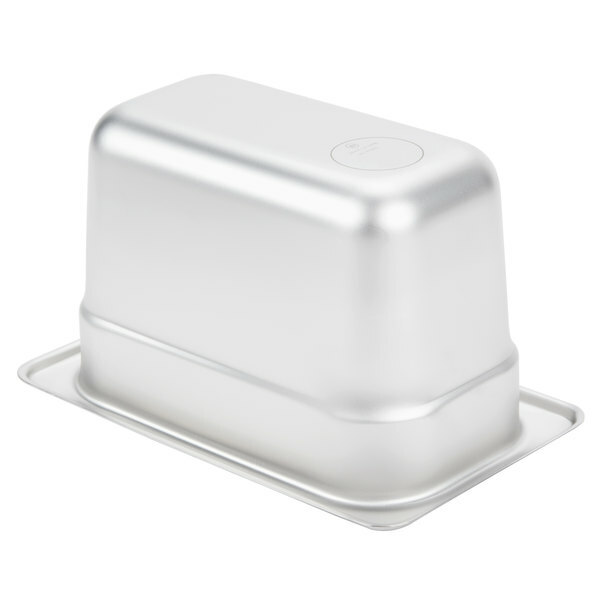 We use these 1/9 sized steel containers for our dressings. They are easy to pull out and refill. good quality, sturdy and resistant, easy to clean and dishwasher safe. stackable so doesnt need a lot of space to store. great adittion to any kitchen! We use these in a sandwich prep station for things like mushrooms where you still need space for it, but not as much as a 1/6 size. This works great. The stainless steel pans work great for holding hot or cold foods. They wash easy and can go through dishwashers. The stainless steel holds up great if accidentally dropped and doesn't chip when using utensils in it. Love these pans! This little guy is the perfect size for small batches of ingredients as well as super easy to store and fits pretty much everywhere. These are my go to pan for all things on the line in the kitchen. The stainless steel is good quality and fits perfectly in cold tables as well. Highly recommend. My new ice cream pan. I love this little pan. I use it to store my homemade ice cream. I just toss it in the freezer and pull it out when I need it. It works much better than glass pans as they are better at retaining temperature. My ice cream doesn't melt anymore. These are absolute restaurant quality. We use these on a daily basis. They are getting dropped and washed and re washed and moved around. The price is so good! These stainless steel pans are a great quality and a fraction of the cost of major name brands. 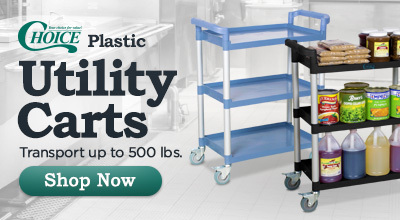 They are versatile, durable and very easy to clean. These are top quality pans. It's about one forth of the cost as the major name brand pans, but they're just as good of a quality. So far so good, hopefully will last us for many many years! Any kitchen needs 30-40 of these on hand at all times. We have so many of them in our kitchen. We use them for garnish for small sauces for so many different things. Well made. Last a long time. A must have in most commercial kitchens, and even great to use at home in place of plasticware. Choice standard weight anti-jam hotel pans are quality made and will last a lifetime when card for properly. Love these food holders! Great product for holding hot and cold food. They clean easily and have good temperature control. Sturdy and durable. Stand up to use! These are a work horse in our establishment. They make sure that we have all of our made to order ingredients ready and able to be used quickly. These are good pans for the most part. They do jam from time to time, and the corner can bend somewhat easily. Other than that, these are great! 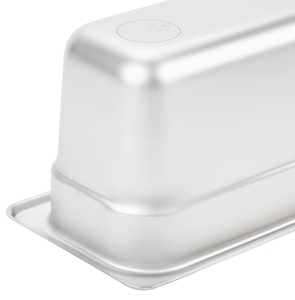 The perfect pan for food storage whether hot or cold. A must have for any restaurant or professional kitchen. These aren't the heaviest gauge that is available but you can't beat the price! I have only ever used these for cold holding, never for hot holding. 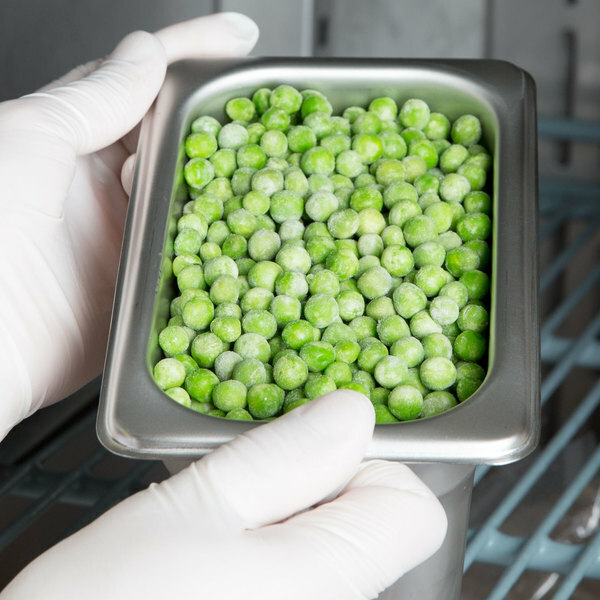 They do a great job keeping fruits and flowers cold when in ice or on our refrigerated top serving unit. Very durable; I expect these will last us forever!